An early teenage obsession with Clint Eastwood movies planted some pretty idiotic notions into my head. Most I grew out of pretty quickly but one remained. After multiple viewings of The Eiger Sanction, I deemed it a viable idea to one day do some mountaineering. I was realisic enough to understand that the Eiger would be out of my reach but right up until about 6 years ago it was in my plans to try and climb Mount Everest. The fact that 1 in 8 fail to return from an attempt didn't seem be a good enough deterrent. What an idiotic version of myself that was, to even consider putting my family through that now seems so incredibly selfish. Watching some of those movies again two things strike me. One is how incredibly sexist and racist they were. Really off the scale, so very very bad. The other is that the versions of the film I had watched many, many times were all heavily cut from the original versions. Seeing them now added a lot more violence to the mix. Strange that the violence was originally cut for television but not the racism and sexism, that was deemed fine! I really did binge watch them so it's a good job that I manage to learn right from wrong with a mind full of these Dirty Harry films and the like. Although I'm currently reading Richard Dawkin's The God Delusion, and I'm very thankful that I wasn't brought up with a heavy (or any) religious influence. Seeing the Eiger on the map when planning a route recently, reminded me of that film. I hatched a plan to visit it or as close as I now would want to get to it. There was a couple of climbs I wanted to ride for my last trip away this year. One to the north, one to the south of the Eiger. I decided to try and ride a circular route around it. With this vague idea in mind I asked Gerald, who I joined on last years trip to Switzerland (see blog here), if he was interested. Within an hour he replied with a route mapped out and the thumbs up to go. Taking the Friday night flight from Heathow, my bike arrived the other side ok this time (see here for when things go slightly wrong when travelling by plane with a bike) and with just a few hours sleep and a few more chapters of Dawkins we were off. To an enthusiastic start, taking the bike paths rather than the road. The road are pretty low on traffic but I always prefer the bike paths. Some are Tarmac but we soon learn they have slightly stretched the 'suitable for road bikes' notion. At times we were off road but it's all fun. 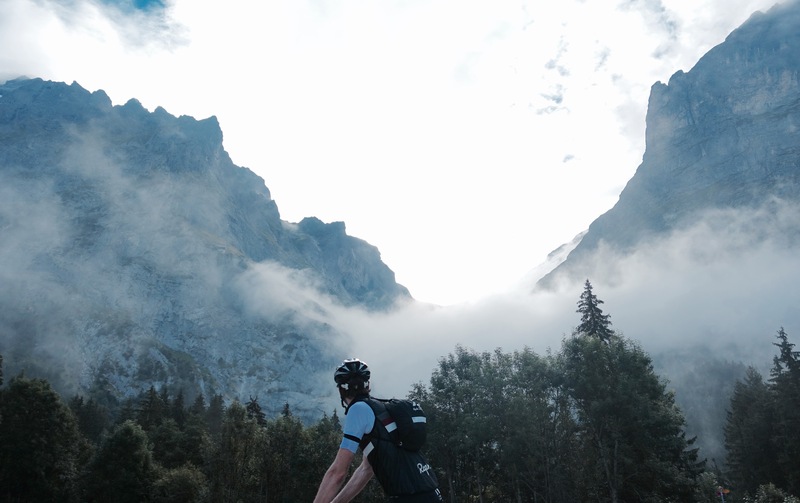 First climb was the Grosse Scheidegg and it is exactly the type of climb I have come to love. A virtually traffic free single road with beautiful views and today's added bonus was a cheese festival at the top! Green pastures, cows and dramatic rock faces including a view of the Eiger itself. A fast clear wonderful descent seals the deal to allow the Grosse Scheidegg as a new edition into my top few favourite climbs. On the descent we pass near to The Reichenbach Falls where Sherlock Holmes met his demise. The next climb was very different. The Grimsel Pass is really long, 26kms but never steep. It's epic in many ways but the abundance of pylons renders it ugly in places. It's also busier than the more remote Grosse Scheidegg is. The forecast rain had not materialised and although the morning had been really misty, it is not cold and we stay dry. Ok, there are two cheats in the route shown in the photo above. Firstly we didn't ride the route in one day. Certainly a few years ago that would have been the only option to, in my mind, successfully complete the concept. My attitude has certainly mellowed recently and a sedate social pace was all part of the ethos of this ride. However our two day strategy meant a little logistical problem. Do we carry all our kit with us? Or somehow get it to our overnight stop location. Here is where the Swiss have things sorted. We will have our bags delivered same day from our start town's railway station to another railway station where we would spend the night. This luggage service is so clever and something I've not seen in any other country. So before we started riding that morning we left our bags at Interlaken station and the plan was we would have to collect them later that same day before 6pm at Brig station some 140kms away across the mountains. Fingers were all crossed. While riding on day one I did wonder wether our bags would be there or not at the end of the day. If not I envisaged having to book into a hotel with no dry clothes and sit at dinner soaking wet or naked! Maybe we would have to check in to a spa and get dressing gowns and slippers! We finish the day's route inside the cutoff time and low and behold our bags are there waiting for us. Brilliant service. Our plan is working. So no longer in need of a fancy spa to dry out we book into a budget hotel right opposite the station. I say opposite, it was actually right above the railway line and a pretty noisy station all night it was too! The hotel looked pretty ropey but the reviews all boasted about an excellent breakfast, and that is the main concern ahead of another long ride tomorrow. Although it also mentioned the rooms having an 'external private bathroom', which was a slight worry! It was all pretty basic but fine. So to more pressing matters....dinner. I usually like to savour the local cuisine. Looking at the menu of the recommended local restaurant, we see cheese fondue. Not just cheese fondue but unlimited, all you can eat cheese fondue! That's just asking for trouble on a plate. Luckily the town was currently playing host to a world food festival, so we opted for that instead. Sampling plenty of different dishes, we slowly fill up with Keynan, Indian, and Chinese cuisine and sample the wine on offer. Luckily enough though the food/wine ratio was high enough to remember to resist the Spanish churros available. That very naughty deep fat fried delicacy looked, by the length of the queue, very popular. There was good news first thing the next day as the breakfast lived up to the reviews. Plenty to tuck into, including about eight types of very nice fresh bread. Now my lunch acquiring technic at breakfast was metioned in my last blog, although I did improve on it this time. Aswell as filling my day bag with sandwiches and croissants, the last thing I did before leaving the buffet was to fill my rear jersey pockets with nuts and cranberries, loads of them. That's a days worth of energy right there. I thanked the staff for the excellent breakfast, obmitting to mention the lunch and day snacks I had pinched. And so to day two, rain again was forecast but we started in the dry. Early on we passed a small town called Niederwald, where César Ritz (the founder of the Hôtel Ritz in Paris and the Ritz Hotel in London) was born and is buried. The first climb was the Sanetsch Pass. Sorry that should be Col de Sanetsch as we have now ridden through the German speaking part of Switzerland into the French speaking sector. The Sanetsch is massive - 29kms in total. It marks a real change in my attitude that I no longer feel the need to charge up these climbs as fast as I can. My riding is so more relaxed and chilled now. I will still push myself to the limit at certain times but having a daughter now tends to make me want to stay in my comfort zone rather than take any risks. Halfway up the Sanetsch however my earlier smugness when stealing the food at the buffet disappeared as I forgot to breathe while eating some nuts and spent a kilometre coughing and half choking with a nut stuck in my throat. As if the Sanetsch wasn't hard enough! Views were restricted today due to low rain clouds but every so often we were subjected a stunning glimpe of the pastures below. We rode most of the climb in the mist, but luckily no rain. The long tunnel near the summit was fun and well lit, actually this road goes nowhere, so it's surprising it's such a good surface. The road ends at the top after a slight descent around a lake and dam. Now to the second cheat. There is no way of descending the other side of the Sanetsch by bike. We take a small cable car down the other side instead. It was very exciting and it makes a refreshing break from the riding. We hook our bikes precariously to the outside and jump in the automated car. It gets going quickly and hair raisingly accelerated over a vertical cliff face, jerked and shuddered as it changes direction downways. A real exhilarating experience and the lovely lady at the bottom, accepts my charm in lieu of the fact I didn't quite have enough money to pay for the ride! Back on the bikes again and to complete the lap. The rain that we had cleverly avoided all weekend finally caught up with us. I don't have a problem riding in the rain. My kit performed well and I stayed warm. Still I was happy enough to indulge in a huge and excellent hot chocolate at out last stop. Then it was back to Interlaken over one more climb. The super efficient luggage service did not fail us, as we ended the adventure by collecting our bags. It was at this stage my mind had already started thinking about redoing the lap non stop next time. So there is still some fire inside me but as Dirty Harry said in Magnum Force, 'a man really must know his limitations' and I am happy and content that I've completed the task I set myself this weekend. I write this blog on the flight home on Monday morning, certainly having packed a lot into the weekend. Enough adventure for now, that is unless BA have mislaid my bike again! For all the route concept, climbs bagged, scenery seen, the best memory of the weekend was just spending time with a good friend. Two days riding together we had a lot of time to chat about everything from saddle sores to the absurd notion of the existence of (any) god. That being said for Christ sake Lord please, although I don't believe in you or any such dictator in the sky, spare us the pain of those damn saddle sores. So until the next adventure....abschied von den bergen (farewell to the mountains).